Flowering maples (Abutilon spp.) comprise about 150 different species of subtropical or tropical shrubs and small trees that bear maplelike leaves and hibiscuslike flowers. These plants may be grown as perennials in regions with mild but frosty winters but bitter winter cold will even kill the root systems so they will not return in spring. 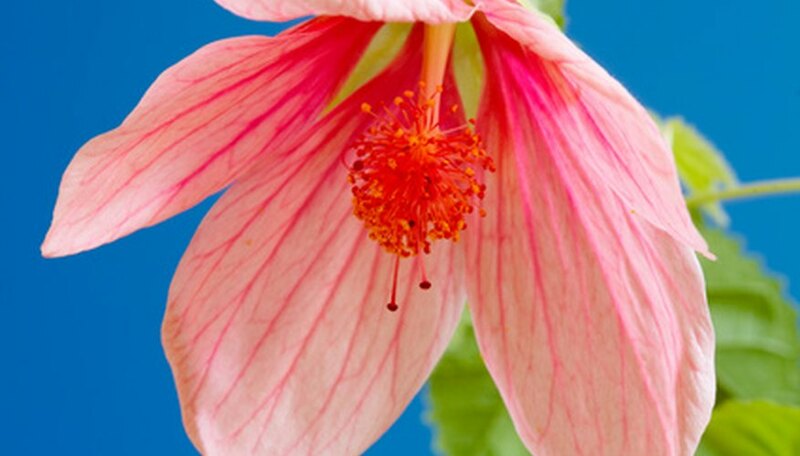 Four species are common in gardens (Abutilon megapotamicum, pictum, ochsenii and vitifolium), but the vast majority today are the result of complex hybrid crosses among many species to form the most ornamental plants in either flower or leaf. In frost-free gardens, "Ashford Red" becomes an erect to spreading shrub 8 to 10 feet tall and equally wide. It bears pale to mid-green leaves with three to five lobes. Its flowers are produced from spring to fall and are nodding, bell-shaped and red. It survives outdoors in USDA zones 9 and warmer. Lovers of white flowers will appreciate those of "Boule de Neige." A vigorous plant that grows 12 feet tall and 10 feet wide where frost doesn't occur, it often produces spreading branches. This hybrid abutilon will die back to its roots in winter if frosts occur, making it a good choice outdoors in USDA zones 8 through 10. "Canary Bird" becomes an erect to spreading shrub 10 feet tall and equally wide. It bears large mid-green leaves with three to five lobes. Its lemon-yellow flowers are produced from spring to fall and are nodding and bell-shaped. It survives outdoors in USDA zones 9 and warmer. Sometimes called or listed in literature as "Louise de Marignac," "Louis Marignac" grows 10 feet tall and wide where winter frosts are absent. Light green leaves make an attractive backdrop to its many large bell-shaped flowers that resemble pink to rose ballgowns. The flowers occur from spring to fall and should be grown outdoors year-round only in USDA zones 9 and warmer. Rather upright in its mature shape and form, "Nabob" will mature at 10 feet tall and 8 to 10 feet wide. The leaves are exceptionally deep jade to emerald green. Its flowers are red, ranging from red-wine to scarlet blood red and are nodding. When open, they have an upside-down bowl shape. Grow "Nabob" outdoors in USDA zones 9 and warmer. Large, maplelike leaves that are green with creamy white to buttery yellow edges make "Souvenir de Bonn" an abutilon that is very ornate even when not in bloom. A vigorous growing shrub with an upright habit to 10 feet tall and 6 to 10 feet wide, it is more beautiful when its orange flowers with red veins appear from spring to autumn. These flowers also are pendent but when fully open are upside-down bowls.